, but I still don't know if it is functional. Right now I would like to know if the Enrage strategy is better than the Ramp strategy, what do you guys think about this? Ball Lightning is cheap, is strong, has both trample and haste. downside is it's good for only one turn. but i do see your reason for Blood Lust. the Ball Lightning becomes a 10/1 with Trample and Haste and with it being an instant you can trigger it anytime you want. however a better instant, if you can find one, is Enrage. with that card you can choose how strong to make Ball Lightning. and with 21 mountains each producing triple mana you can pour a ton of mana into Enrage to make the Ball Lightning even more powerful. CameronValimere It looks like someone else already added Enrage Check this link for more. I'm adding Jaya Ballard, Task Mage under the Promo Set for Gatherer (PSG) now. VietMoneys Added Ashnod's Coupon promo under the 000 expansion. candyking24 Added Gaea's Blessing Arena promo under the 000 expansion. I just noticed you had Enrage which seems mostly worse than Balduvian Rage. But yeah, Zada is awesome! I can't quite commit to playing mono red so I've built a couple versions with her and Mirrorwing Dragon in the 99. I'd love feedback and suggestions on my Zada Package card collection! What do you think are the strongest cards with Zada? I saw Rites of Initiation and that looked like a surprisingly awesome wincon! Really good decks start out with a solid idea and evolve over time and play testing. Here's some ideas based on my experience. Ugin's Nexus to keep people from taking extra turns. Goblin Welder for artifact recursion. Even if they counter something like the Nexus or Contagion Engine. Jester's Cap is great at ripping combo decks apart by removing key components. It also works well with the Goblin Welder. Bonehoard is better than Nightmare Lash in multi-player games as it sees everyone's graveyard. Grafted Exoskeleton really should be in this deck to help push the infect theme and make any creature a significant threat. Infiltration Lens, for the card drawing. The defender chooses to either take the damage or allow you to draw two cards. Skithiryx, the Blight Dragon also should be in this list. Kumano, Master Yamabushi as an alternate win conditions via direct damage. With the Grafted Exoskeleton it's a short game. Fallen Ferromancer, Frostwielder, Spikeshot Goblin, or Prodigal Pyromancer to get around those pillow fort opponents. 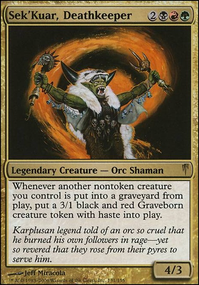 Kaervek the Merciless to make it hurt for those combo players. Virulent Swipe as a better creature pump spell. The rebound means you get twice the effect out of one card. World at War is another extra combat phase card. Also rebounds. War Elemental can get huge. 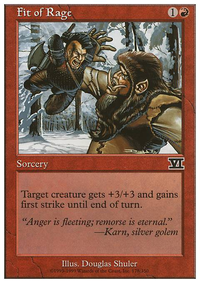 When paired with a Surestrike Trident it becomes a quick way to kill a player each turn. Loxodon Warhammer for tample and life gain. Any creature in the deck is better with a Warhammer. Spikeshot Goblin is really fun with the Warhammer. Relic Putrescence could be fun on someone's mana artifact. Anthem of Rakdos deals too much damage to you. Per Gatherer: "The first ability triggers once for each creature you attack with. If you attack with three creatures, for example, theyll each get +2/+0 and youll be dealt 3 damage." Horrible when you have multiple combat phases per turn.Talisman of Indulgence should be a Rakdos Signet so you don't take as much damage. Lashwrithe is too conditional on your lands in play. Nightmare Lash same problems Lashwrithe. Thunderscape Familiar and Nightscape Familiar don't promote your theme and are not strong enough on their own to be worth having on the field. If you really need the mana reduction, you're better off with more land cards. Scorchwalker is a mediocre creature and a crappy pump spell. There are too many better creatures. These cards are all single creature pumps that don't help you at all if an opponent plays a Wrath of God or similar effect. One-shots are nice against a single opponent, but not in multiplayer. Haze of Rage, Reckless Charge, Tormenting Voice, Balduvian Rage, Brute Force, Enrage, Reckless Spite. The X mana pump spells are really bad because of the mana choices that playing them forces on you each turn. Leave mana open for the X pump spell or play another card? Not worth it. Inquisitor's Flail is a maybe. This one is kinda a tough choice. I would cut it for a better card but leave it in if your budget or collection doesn't have another option. 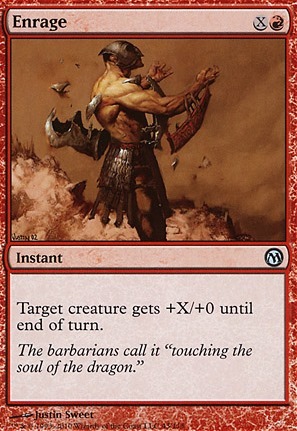 Bonesplitter is another mediocre card that's only good if there isn't a better option. Swiftfoot Boots and Lightning Greaves The haste is nice but they are really only good against spot removal. I would leave these in until you need to cut them to make room for better cards. Obviously, temper these suggestions with your collection and budget. Feel free to check out my decks and let me know what you think of the ideas. I like what you have here. I assume your idea is a cast Ishai and then give him double strike and lifelink with Bruse. If that's the case, I definitely agree with Dukevs on the Swiftfoot Boots. I'd also heavily suggest an Inquisitor's Flail. If you want to stick a little closer to the prowess you have going on here, I definitly suggest Balduvian Rage, Enrage, Rush of Blood, and Titan's Strength. Overall, I love what you have here.